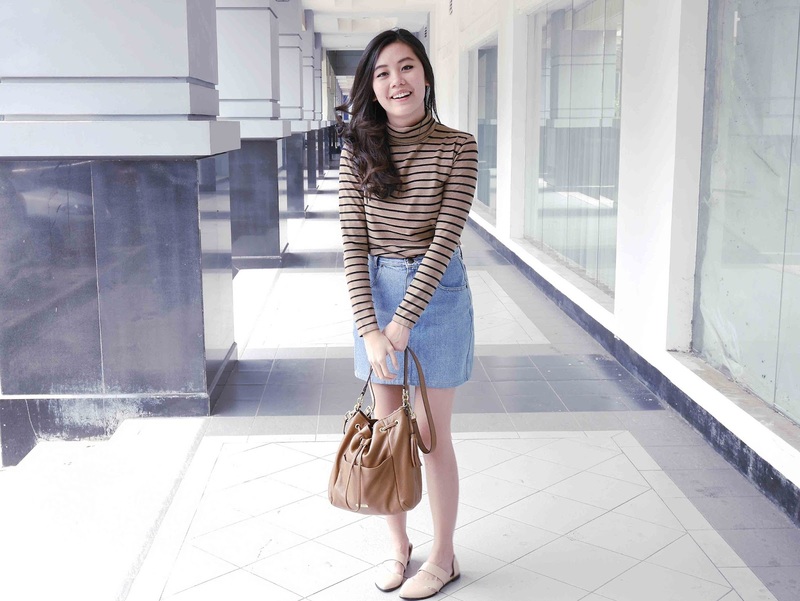 This outfit was the first of the day, channelling 90s look with stripe turtleneck and old-school denim mini skirt. I went to get a Korean lunch and ran a couple of errands with boyfriend. After that we went home and put our Cinderella mood on. Yes we swept and mopped the most parts of the house! That was probably more sports I did in three hours today than I did in the last month, hahaha. But boyfriend was really supportive and helpful, couldn't ask for a better life mate :) (if you're reading this, which I know you will at some point, I didn't just say that because you were quite a partner in doing the chores, but also because I love you and kind of already decided that you are). In the evening I and my sister and our boyfriends took mom and dad out for a semi-surprise anniversary dinner, it is their 28th year now. I said semi-surprise because they knew we were going on a celebratory dinner but had no idea that we planned a little more than that, with the decorated dessert and the gift and all. It barely compares to what mom and dad have done for us throughout our lives, but I hope they consider tonight as a token of appreciation and love nevertheless. For me, it's amazing to witness a relationship going so long and so strong. It was a happy night for all of us, although we were missing our little golden boy a.k.a my brother yet again. Anyway, photos are posted on my Facebook and some on Twitter. I might post some on Instagram too. One more weekend to December! Oh Christmas month is most exciting. I am stoked to realise all the exciting plans I have been cooking and make every counting days to Christmas memorable. Are you feeling the jolly season yet? Beautiful outfit! You're so cute!!! I just decorated the flat today with my daughter, to get into the festive mood for the first advent tomorrow! You look lovely! I really like the shirt! It all sounds like such a lovely time! I LOVE your outfit, channeling the 90s in such a great way! I love Christmas time too! Love the outfit! Your style is so beautiful!